Despite the commonly accepted view that prejudice against left-handedness is a thing of the past, left-handed schoolchildren are still being given a raw deal in schools, according to a new study released today to mark International Left-Handers Day. The research was carried out by The Left-Handers Club among 1,000 left-handers under 25 years of age and in full time education, to find out whether schools cater for the specific needs of their left-handed pupils. Nearly all left-handers surveyed (99%) had experienced difficulty with their handwriting, yet only 10% had received specific guidance on left-handed writing techniques from their teachers. Despite teaching aids specifically for left-handed children now being easily available via specialist websites such as www.anythingleft-handed.co.uk, only 3% of students had specific writing practice mats/word formation exercises for left-handed writing and, most worryingly, a startling 85% had never been taught the best posture and paper positioning for writing left-handed. This basic training is essential, particularly since 76% of students complained of back ache or hand fatigue when writing, due to a poor writing style. Smudging is a common problem for left-handers, with over 88% experiencing this problem, yet only 7% had ever been given guidance on improving their hand position to eliminate smudging. Even the most basic tools were not made available in a large number of classrooms. Only 18% had access to a left-handed fountain pen, or pen with left-handed finger grips. Scissors are the most common difficulty among left-handers, yet only 44% of respondents had ever had access to proper left-handed scissors, in a great many cases because these had been provided by their own parents to take into school. A great many left-handers realise that the correct tools and equipment would improve their performance, yet do not feel that their school appreciate this. 88% of left-handers feel that their school or teachers should give greater consideration to their needs, yet despite 90% of pupils knowing left-handed scissors would benefit them, only a tiny proportion (16%) felt confident to ask their school to provide these, and sadly often to no effect. Many such requests were met with comments such as: “it is not cost-effective to provide specialised equipment for such a small group” or “you just need to learn to cut with your other hand”. Such comments show a blatant disregard for the rights of left-handed children to equal learning experiences, and alarming ignorance of the relevance of hand-eye co-ordination and enhanced fine motor skill development in a child’s naturally dominant hand. For many left-handed pupils, shared computer equipment can pose problems, since desk layouts and positioning of the computer mouse are more efficient for left-handers to use if they are reversed. Sharing a computer with one or more right-hander makes constant re-positioning or alternative equipment impractical, yet 41% of lefties believed they would be more efficient with an alternative desk layout. Since 31% of left-handers use a computer mouse on the left side of their keyboard, an ergonomic left-handed mouse is one of the most popular requests for left-handed equipment. However, specialised equipment is not necessary, since a standard mouse can easily be set up to work for a left-hander. Despite this, only half of the pupils surveyed had access to a left-hand mouse setup in their school IT department or classroom. Practical subjects such as DT, woodwork & metalwork which involve using heavy machinery also raised concerns, both with blade positioning and over the positioning of safety overrides, which, according to 49% of respondents are positioned for right-handers convenience. This means that left-handers can lose valuable seconds in an emergency, as they would instinctively reach out with their dominant hand in moments of stress. Alarmingly, it appears very few teachers give specific safety guidance to left-handers on the best positions to adopt when using such machinery. Students are even being told to “use it right-handed” which not only means relying on their weaker hand, but also impairs hand-eye co-ordination, making them less accurate which can have disastrous consequences. “I was badly hurt and almost lost several fingers because a belt sander was only made for a right-handed user. I used it "properly" (right-handed, since I was afraid I'd hurt myself by crossing my arms over) but my right hand was not strong enough to hold the wood steady and slipped; my hand was pulled inside and sanded down to the bone.” Maggie O’Toole, Age 20. In textiles and food technology, left-handed students also found that they had to adapt in an awkward manner to get right-handed kitchen tools to work (95%), and to reverse sewing patterns and techniques (63%) yet only 9% of students had ever received any teaching on left-handed techniques. “Sewing was a nightmare because the teacher would do it right handed and I would ask her how do I do it left handed and she would just tell me to work it out myself!” Julia Cook, age 25. Opinions on music studies were fairly divided. Many children studying guitar were confronted with difficulties through their handedness, with 49% of left-handers being encouraged to play the guitar right-handed. The common reasons for this were the expense of left-handed guitars, inability to swap guitars with other pupils, and quite often, the inconvenience to the teacher of having to teach left-handed. However, an equal number of left-handed musicians felt music was a particular strength for them, and allowed them to use their creative talent. A common problem encountered by novice pianists occurs with the dynamics of playing, since the left hand (which plays the rhythm) is often louder than the right (playing the melody). Practice, however, usually solves this problem, and many left-handers go on to be accomplished musicians. Sports, was an area of great encouragement for lefties, with 47% of students feeling they were at an advantage in their chosen sport. Left-handers felt they particularly excelled in combative sports (fencing, boxing, wrestling) and racquet sports (tennis, squash, badminton). The traditional advantage of left-handers in cricket, rounders and baseball was also confirmed. Problems were encountered by 49% of respondents with right-biased equipment for some sports e.g. golf clubs, baseball gloves, and many highlighted the fact that it is against the rules to play field hockey left-handed. On a more positive note, The Left-Handers Club actively encouraged members to highlight schools that have taken significant steps to meet the needs of their left-handed pupils. Many children nominated their school for a “Lefty Friendly Award” which the Left-Handers Club awards to schools who provide specific training and equipment for their left-handed pupils. Participants were also keen to point out the advantages they felt left-handedness offered. Art, computing, creative writing, music and drama all featured highly as areas of excellence, which respondents considered best used their talents for creativity and abstract thinking. The overwhelming message from this survey is that there is a significant gap in teachers’ knowledge relating to their left-handed pupils. Far too few teachers are aware of their left-handed students’ needs and crucially do not know how easily these needs can be met. - improve education, facilities and equipment design. * The Club is responsible for International Left-Handers Day, an annual event when left-handers everywhere can celebrate their sinistrality and increase public awareness of the difficulties and advantages of being left-handed. 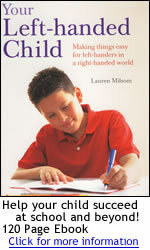 Visit www.lefthandersday.com for more info.